We all have experienced having to write a paper and then suddenly nothing happens. We sit at our laptop, and end up surfing the Web instead of writing. Every kind of motivation comes to mind, except the one to write. You may even decide to at least start and find that an hour later, you are still struggling with the first paragraph. However, there are some simple ways to ensure your writing flows. The main one is that you need to have something to say. This seems basic enough, but it means you need to have done some preparation. First, if you have not researched and read up on your subject, you cannot flow. Your mind needs to be brimming with what you have read, what you agreed with, what you disagreed with and your own opinions. 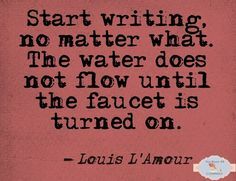 When you are full of your subject, your writing will flow. Next, you need to have understood your subject well. Learning is not just the collecting of information, memorizing it, and repeating what you read like a parrot. You need to ensure the information you gather, you absorb and understand. Once you understand your subject, it becomes part of you, whether you agree with it or not. Having grasped and understood your subject, then begin to sort out the ideas in your mind. What do you understand about the subject? Is your own opinion in harmony with that understanding? If not, what are your reasons, and what support do you have for your position? Now that you know your subject and your views on it, form it into a coherent plan for presentation. If you know what you want to say in a simple statement, then you are ready. Just write your point. Then start to write what you want to say, why, and give support to your argument, and you will find that it does flow. Write it down as it comes to your mind. Concentrate on putting the thoughts down. Use a new paragraph for each new thought. If you start to concern yourself with spelling, grammar, and sentence construction while writing, you will kill the flow. Once you have finished capturing your flow, you can go back and do the technical side. Sort out paragraphs, connecting sentences, spelling, grammar, and punctuation. If you know your subject and have clear views on it, your writing will flow.